Posted on 07 October 2016. 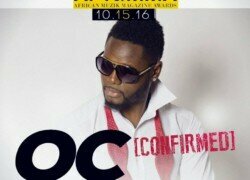 Musician OC now based in the United States of America is among the many artistes lined up to perform at the prestigious African Muzik Magazine Awards (AFRIMMA) set to take place on October 15th in Dallas. This is the third edition of the AFRIMMA which has proven to be one of the biggest African music awards in Diaspora. The event this year will be strategically hosted by comedian Basketmouth and ‘Real Housewives of Atlanta’ star, Cynthia Bailey. Following the success of the 1st and 2nd editions, there are a lot of expectations for this year’s event which has packaged great entertainment and music performances from Africa’s top entertainers. OC is very excited about this task and will be looking forward to promoting his latest single, ‘Tie Your Wrappa’ featuring Nigeria’s Ilyana. The artiste has enjoyed favorable feedback following its release and now OC is set to hit big stage. Additionally, Zambia is also being represented by two hard-working artistes who form part of the nomination list as voting continues. These are Cleo Ice Queen who was nominated for the best female-Southern Africa, and Roberto who is on the best Male-Southern Africa. Cleo is competing against the likes of Zonke, Miss Lira, Lizha James, Pah Chihera and Busiswa among others. Roberto faces AKA, Black Coffee, The Dogg and Casper Nyomvest to mention only a few. Many more of Africa’s most impressive names on the music scene in the past calendar year also earned a mention in highly competitive categories. Wizkid, Flavour, Davido, Sarkodie, are joined by fresh faces like Falz, Mr. Eazi, Locko and Bisa Kdei on the AFRIMMA 2016 Nominees list. Also for the first time in the history of AFRIMMA, North African music and Caribbean music have been recognized with categories. Centred on celebrating African music and heritage, the 3rd edition of AFRIMMA promises to be another festival with full of African music.